1. Make an object porous or add porous elements (inserts, coatings, etc.). 2. If an object is already porous, use the pores to introduce a useful substance or function. 1. Change the color of an object or its external environment. 2. Change the transparency of an object or its external environment. – Make the container out of the same material as the contents, to reduce chemical reactions. 1. Make portions of an object that have fulfilled their functions go away (discard by dissolving, evaporating, etc.) or modify these directly during operation. 2. Conversely, restore consumable parts of an object directly in operation. 1. Change an object’s physical state (e.g. to a gas, liquid, or solid). 2. Change the concentration or consistency. 3. Change the degree of flexibility. 1. Use phenomena occurring during phase transitions. 1. Use thermal expansion (or contraction) of materials. 2. If thermal expansion is being used, use multiple materials with different coefficients of thermal expansion. 1. Replace common air with oxygen-enriched air. 2. Replace enriched air with pure oxygen. 3. Expose air or oxygen to ionizing radiation. 5. Replace ionized oxygen with ozone. 1. Replace a normal environment with an inert one. 2. Add neutral parts, or inert additives to an object. Change from uniform to composite materials. Use a high speed dentist’s drill to avoid heating tissue. 1. Introduce feedback to improve a process or action. – Change a management measure from budget variance to customer satisfaction. 1. Use an intermediary carrier article or intermediary process. 2. Use waste resources, energy, or substances. 1. Instead of an unavailable, expensive, fragile object, use simpler and inexpensive copies. 2. Replace an object, or process with optical copies. Replace an inexpensive object with a multiple of inexpensive objects, comprising certain qualities (such as service life, for instance). 1. Replace a mechanical means with a sensory (optical, acoustic, taste or smell) means. 2. Use electric, magnetic and electromagnetic fields to interact with the object. 2. Isolate the object from the external environment using flexible shells and thin films. Projects of all kinds frequently reach a point where as much analysis as possible has been carried out, but the way forward is still unclear. Progress seems blocked, and if the project team is to move forward, it must develop creative solutions to the problems it faces. You’ll already know about techniques such as brainstorming, which can help with this sort of situation. However, this type of approach, which depends on intuition and the knowledge of the members of the team, tends to have unpredictable and unrepeatable results. What’s more, a huge range of possible solutions can be missed, simply because they’re outside the experience of the project team. TRIZ is a problem solving methodology based on logic, data and research, not intuition. It draws on the past knowledge and ingenuity of many thousands of engineers to accelerate the project team’s ability to solve problems creatively. As such, TRIZ brings repeatability, predictability, and reliability to the problem-solving process with its structured and algorithmic approach. “TRIZ” is the (Russian) acronym for the “Theory of Inventive Problem Solving.” G.S. Altshuller and his colleagues in the former USSR developed the method between 1946 and 1985. TRIZ is an international science of creativity that relies on the study of the patterns of problems and solutions, not on the spontaneous and intuitive creativity of individuals or groups. More than three million patents have been analyzed to discover the patterns that predict breakthrough solutions to problems, and these have been codified within TRIZ. TRIZ is spreading into corporate use across several parallel paths – it is increasingly common in Six Sigma processes, in project management and risk management systems, and in organizational innovation initiatives. Somebody someplace has already solved this problem (or one very similar to it.) Today, creativity involves finding that solution and adapting it to this particular problem. Problems and solutions are repeated across industries and sciences. By classifying the “contradictions” (see later) in each problem, you can predict good creative solutions to that problem. Patterns of technical evolution tend to be repeated across industries and sciences. Creative innovations often use scientific effects outside the field where they were developed. Much of the practice of TRIZ consists of learning these repeating patterns of problems-solutions, patterns of technical evolution and methods of using scientific effects, and then applying the general TRIZ patterns to the specific situation that confronts the developer. Figure 1, below, describes this process graphically. Here, you take the specific problem you face, and generalize it to one of the TRIZ general problems. 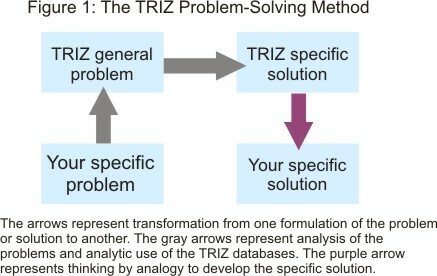 From the TRIZ general problems, you identify the TRIZ solutions to those general problems, and then see how these can be applied to the specific problem you face. A powerful demonstration of this method was seen in the pharmaceutical industry. Following the flow of Figure 1, the specific problem was as follows: an important process needed cell walls to be broken down in bacteria cells so that hormones inside the cells could be harvested. A mechanical method for breaking the cell walls had been in use at a moderate scale for some time, but the yield was only 80%, and was variable. Higher yields and a scaleable solution were needed. The cell walls could be broken by sound waves (from the pattern of evolution of replacing mechanical means by fields). The cell walls could be broken by shearing, as they pass through the processing facility (using the resources of the existing system in a different way). An enzyme in the fluid could “eat” the cell walls and release the contents at the desired time. All three methods have been tested successfully. The least expensive, highest yield method was soon put in production. Join the TRIZ LEVEL 1 WORKSHOP to experience hands on to handle contradiction problem. The product gets stronger (good), but the weight increases (bad). Service is customized to each customer (good), but the service delivery system gets complicated (bad). Training is comprehensive (good), but keeps employees away from their assignments (bad). Software should be complex (to have many features), but should be simple (to be easy to learn). Coffee should be hot for enjoyable drinking, but cold to prevent burning the customer. Training should take a long time (to be thorough), but not take any time. Dairy farm operators could no longer dry cow manure for use as fertilizer due to an increased cost of energy. They were faced with a technical contradiction between dry manure (good) and cost (bad). TRIZ led the operators to a drying method used for the concentration of fruit juice, which required no heat. The Ideal Final Result and Ideality. Functional Modeling, Analysis and Trimming. The 40 Inventive Principles of Problem Solving. Laws of Technical Evolution and Technology Forecasting. In the course of solving any one technical problem, one tool or many can be used. One of these tools, “The 40 Principles of Problem Solving” is the most accessible “tool” of TRIZ. The 40 Principles of Problem Solving Click here to download example for 40 principles. These 40 Principles are the ones that were found to repeat across many fields, as solutions to many general contradictions, which are at the heart of many problems. A list of all 40 Principles of Problem Solving can be found at http://www.triz-journal.com/archives/1997/07/b/index.html.